1831 – Mediocre pupil at the “Petit Séminaire” at Ornans. His drawing master, “le Père Beau” makes him work from Nature. 1837 – Enters the College Royal de Besançon. Courbet has lessons from M. Flajoulot. 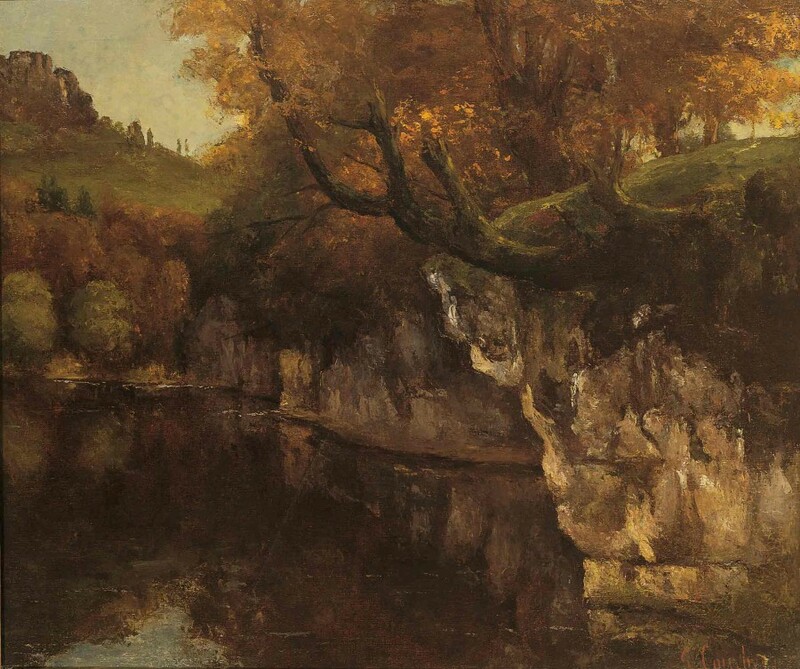 1841-44 – Courbet arrives in Paris and decides to become a painter. He pays frequent visit to the Louvre, where he studies ans imitates the Old Masters, with a marked preference for Velasquez and Rembrandt. He paints several portraits of members of his family and of himself, as well as lanscapes of Franche-Comte. All his life he is to remember the Valley of Ornans. 1844-48 – His first masterpieces, Courbet au Chien noir, painted in 1842, is also the first entry he submitted to the Salon. In 1847, however, all these pictures are refused. Courbet goes to Holland. 1849 – Courbet makes friends with Corot, Baudelaire, and Proudhon… In the Salon, L’Après-dinée à Ornans, earns him a second medal, and the picture is bought by the State. He paints Les Casseurs de pierre and he starts on L’Enterrement à Ornans. 1850-51 – His eight pictures are accepted by the Salon : Les Paysans de Flagey revenant de la foire, and above all L’Enterrement create a scandal. 1852 – The picture Les Demoiselles de village is bought by the Comte de Morny, the most powerful dignitary of the First Empire. 1854 – Alfred Bruyas invites Courbet to Montpellier. At Ornans he begins to carry out his plan for a big picture – L’Atelier, allégorie réelledestined for the Exposition Universelle of 1855. 1855 – L’Enterrement and L’Atelier are refused by the jury of the Exposition Universelle. Courbet has a pavillion erected facing the Palais de l’Exposition, and opens his “Exhibition of 40 painting and drawings”. In the catalogue is published the manifesto on Realism. Courbet is henceforth the leader of the Realist School. 1856-60 – In each Salon, he provokes currents of hatred and admiration with such canvases as La Curée, La Biche forcée…He returns to Montpellier, and from here to Frankfurt, where he is received with enthusiasm. 1861 – Courbet’s notoriety is now established. Abroad, he is looked on as a Master. Returning to Paris, he is asked by young artists to open a studio, to which he consents. 1862-65 – He spends the summer of 1865 at Trouville, together with the young Whistler. 1866 – The leader of the Realist movement is now triumphant. 1870-72 – The critics, who were formerly hostile to the Maitre d’Ornans, now revise their opinion and proclaim this incontestable genius. After the fall of the Empire, he is President of the Arts Commission and participates in the Government of National Defence, but he accepts the idea of the déboulonnement of the Vendôme Column. He is arrested, pronounced responsible for the destruction of the Vendome column and condamned to 6 months imprisonment. His sentence served, he returns to Ornans (May 1872). 1873 – He continues to paint. His case is re-opened by the State and his goods confiscated. Fearing for his freedom, he goes into voluntary exile in Switzerland on July 1873. 1873- December 31, 1877 – The little town of La Tour-de-Peilz near Vevey, affords a pleasant refuge. He lives at the edge of the lake in a fisherman’s house, called Bon Port. He suffers from a serious illness and is depressed by his exile. He dies at La Tour-de-Peilz on December 31 1877.